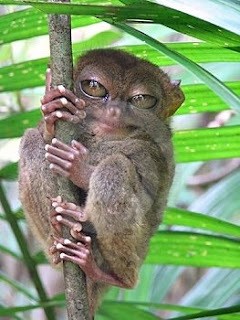 I am a Tarsier fan, ever since my wife who is from Bicol told me about them. We are planning to visit the area in Bohol that Tarsier's live and I have been joking that I want to bring one back with me. They are very friendly monkey like animals which feed on insects and small animals. They are not afraid of humans and will climb on you and let you hold them. They are very friendly and I keep thinking they would be a cute pet but I have been assured they will not let you take them :-). 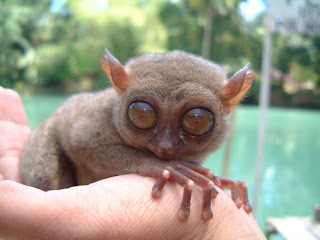 you have very good shots of the Tarsier. 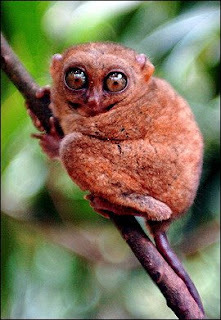 Tarsiers have become rare nowadays. They are mostly nocturnal. There are lots of cases of tarsiers killing themselves by banging their heads on the cages or bars or by doing "hunger strike" because they got depressed being "harassed" by unknowing tourists. They are not meant to be pets as they are too shy and would rather want to be left alone. It was only recently that tarsiers were captured more than before due to "tourist attraction" purposes but government assured that they are "regulating" this. I wonder how they regulate the suicides of the tarsiers though?